- constant, strobe, 2 fiber LED Light modes make you be seen in the darkness clearly and obviously even without illuminate of other lamplight. 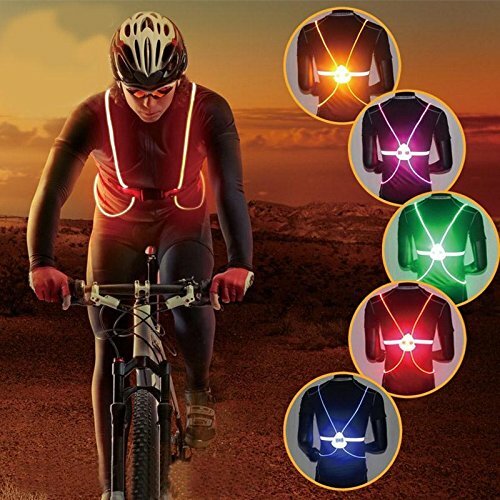 - Besides the led vest, the belt of our product is also reflective, it will be reflective when it is irradiated by other lamplight in the dark which help you be seen in the dark 360°. The length of the belt is adjustable too, no matter what size are you, the vest will fit you perfect! - 4 bright LED powered by two coin type batteries which provide up to 35 hours constant light and 72 hours strobe light for the fiber LED modes. - Only 2 button for switching 2 modes of two fibers. - When the power of battery die out, you can just push the two sides of the button, the battery doors will open, then you can replace the batteries. The battery type is CR2032. - Running, cycling, hiking, some else outdoor activities, etc, SIZE:24 - 45 inches of your waist will be suitable. Reflective distance: 200 meters outside. The visible cold: 14℉ and -22℉.